This program fosters humour, team building, de-masking in a playful way and learning to see in another way. The humour promoted in this program is healthy and productive. After clowning around for 1 hour moods will change, as will the outlook on life. Let’s face it at times life is a joke and it is important to find the funny side and not take it all too seriously. The workshop, depending on demand can be extended to a half day workshop to explore humour, happiness and clowning around to build teams. I travelled to Russia with Dr. Patch Adams and it was there that I saw the power of it. Here is some inspiration from the film Patch Adams played by the wonderful Robin Williams (miss him). We can learn to have fun even in serious places. The Clowning Around Team Building Workshop is designed to bring back to business a positivity that is both open and fun. The program is delivered by ‘Peace-fool the clown’ so expect some frivolity to lift moods and re-energise staff. Be a clown for part of your day and experience what it is like to bring joy to a moment and enjoy it with others. We are not so different. Why not find your clown and come out and play. In a really nice way. Clowns offer a space that is safe, freeing and fun. It enables people to release stress and reconnect with the art of play. The clown is a powerful symbol of fun, equality, esteem and non-judgement. Participants who enjoy where they work and feel free enough to share a good joke with colleagues are more likely to stay with the company. Richard Branson is a good example of a corporate clown who had plenty of time to laugh and enjoy life. Work is a part of life and as we lighten up we work more harmoniously with each other and many become friends. Clowns or laugh makers are an ancient art form found virtually in every culture. The messengers of humour have been characterised by the fool, clown, trickster, joker, buffoon and jester. They operate outside the norms of society and simultaneously are near the centre of human experience. The laugh makers serve an important function as a safety valve for society. It provides a sense of empowerment to the majority and upholds social order. According to the philosopher Goethe, humour in comedy frees the human spirit from passion providing a channel to envision the world clearly and serenely and to laugh at life’s inconsequentialities rather than weep. From the early 1970s there have been only a few researchers conducting humour studies. Psychologists have considered humour important, humour is evident wherever there is social interaction. The fact that we feel good after we laugh suggests that laughter is important for health and well-being. Humour is an elusive concept, there is no agreement by sociologists on how it should be determined. It is accepted that humour involves communication amongst at least two people and is determined by social forces. Sociologists are in agreement that jokes only become jokes because of the social responses to them. Psychoanalysts assert that humour expresses underlying issues that cannot be expressed directly. The clowning is inspired by Patch Adams. Many people do not know that Patch Adams was suicidal which had an influence on the direction his life took. He chose joy over depression. H chose to study medicine and realised the health effects of laughter and clowning. He decided he wanted to help people and as a result of his vision the movie with Robin Williams was produced. Susan was personally invited to Russia by Dr. Patch Adams. Patch taught the power of care, team building and service through clowning and the importance of happiness and humour in the healing process. Psychological and physical injury is affected by positive emotions in my opinion and has often been underestimated as a solution to a range of issues. The trailer of the movie Patch Adams below gives powerful insights into the importance of humour in treating people not the disease. Bullying and stress creates dis-ease and positivity deflects pain enabling a person to find their inner resilience and generates endorphins. 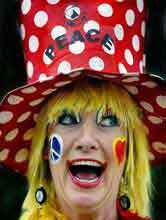 Susan Carew aka Peacefull has been a professional clown for 14 years and a facilitator for 19 years (since 1995). She comes to the workshop as ‘Peacefull the clown’ and instructs staff on how to be a real clown. Joking and silliness is encouraged in this workshop. The style of facilitation is experiential as she guides staff through the psychology, community building aspects and reveals a range of clown techniques (that can be practiced at home). The workshop is free energy, it is energising, groovy music (don’t think of Dr Love) and props to play with to bring out the clown from behind the corporate mask. It is time. Better to do this in a controlled workshop then be reported on facebook or a security camera. This way you all do the workshop together. There is safety in numbers. The workshop is definitely fun and stimulating. In 2002 Susan was personally invited by Patch Adams to attend his Healing with Humour tour in Moscow, Russia. This tour is an annual event to Russia to build bridges of friendship between the Russians and Americans. Patch organises a group of clowns from all over the world to visit those in need. The clowns visited hospitals, nursing homes, orphanages, on public transport and clowning on the streets with the public. It was evident that the clowns had an effect of bringing people together and encouraging them to spontaneously have fun, dance or simply play. The experience created connection with the locals transcending language, age, custom and culture. Clowning is a wonderful way to release tension and build the groups through play and harmony. All participants on this program said that the experience changed their lives and the way they looked at others. Susan has conducted clown workshops with a wide range of corporate and not-for-profit organisations to share with them an experience of joy, playfulness and stretching past the comfort zone. It is an excellent process for learning confidence, courage and reconnecting with positive feelings. Positive employees are creative, supportive and a joy to work with. The wellbeing aspect of working life is often seen as not important as the serious workshops, yet it is the most important as the focus is on mental health, happiness and community building. Building strong happy communities at work alleviates much potential or latent conflict from eroding or overtly surfacing in a range of ways. Investing in community building that is supportive and engaged is a deterrent to the arising of negative behaviours that undermine people’s lives and work processes. Since 2010, Susan has travelled the world visiting 20 countries and clowning with locals of that country. Susan has clowned in: Thailand, Cambodia, Vietnam, India, Egypt, UK, Ireland, USA, Costa Rica, Peru, Bolivia, Argentina, Chile, New Zealand and Nepal in 2014. She has experienced that clowning is a universal value that is understood even in places where clowns haven’t been seen. She has clowned in slums, orphanages, schools, nursing homes, HIV clinics, hospitals, mental health clinics, schools for the blind and deaf, community organisations, bonded labour, cancer centres, remote tribal communities and universities. She has clowned with young people to the elderly and had a wonderful time sharing the joy. Since then she is still clowning around… this is a real job!! Making life/work more fun! why not decide to snap out of moods and let’s learn a little about the wonderful Patch Adams my hero! Demonstration with clown props, learn to mime, juggling your job and improvisation. This is an environmentally friendly workshop.